William Gilfoyle left Liverpool, England on the S.S. North American on 23 May 1867 bound for Quebec. There were 500 adults on board for a voyage lasting 32 days. He is listed as Kilfoyle, W, 21, labourer, Irish adult. He seems to have come by himself. 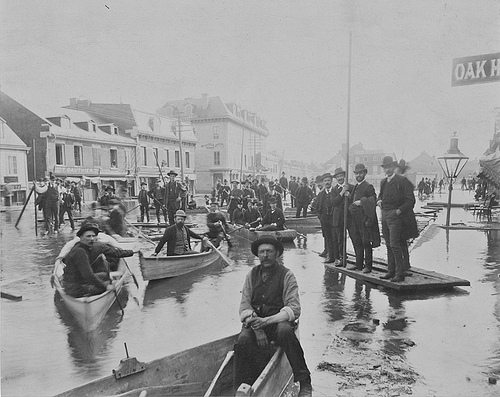 In the Canadian Census of 1871, William is in Hochelaga, Montreal, listed as William Kilfoyl 24, working as a ‘domestique’ (servant) for the Laurie family. On 6 April, 1875, in Saint Cunegonde Catholic Church, Little Burgundy, Montreal, William Kilfoyle 28, son of Martin Kilfoil and Ann Ryan of county Kilkenny, Ireland marries Sarah Conlin 21, daughter of Luke Conlin and Jane Driscoll of Wentworth, Argenteuil, Quebec. Both the bride and groom are from the parish. The witnesses are Thomas Finlay and Margaret Kilfoyle, sister of the groom who signs Kilfoyle. William signs Kilfoile. His occupation is not indicated. William and Sarah have a daughter, Mary Ann Kilfoile, born 18 Jan 1876, and baptized at Saint Ann Catholic Church, Griffintown, Montreal. William signs Kilfoile. He is a policeman. Margaret Kilfoile, William’s sister, is a sponsor and signs Kilfoile. A son, Patrick William Kilfoil, is born 16 Mar 1880 and is baptized at Saint Ann. William is absent. He is a policeman. 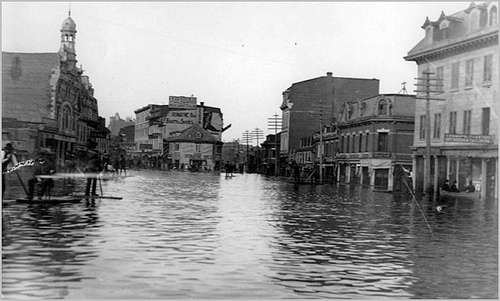 In the Canadian Census of 1881, William is in St. Antoine Ward, Montreal listed as Guilfoyle, 34, policeman, living with his wife Sarah 28, daughter Mary Ann 5. Their one-year-old son, Patrick William, does not appear in the census with them, but another Patrick Guilfoyle, 31, carpenter, does. A son, Martin James Guilfoyle, is born 7 Feb 1882 and is baptized at Saint Ann. William is absent. He is a policeman. A daughter, Margaret Jane Kilfoyle, is born 16 June 1884 and is baptized at Saint Patrick Catholic Church, Montreal. William signs Kilfoyle. He is a labourer. By April 1886, William 39 and Sarah 32 have 4 young children: Mary Ann 10, Patrick 6, Martin 4 and Margaret, almost 2. We do not know where they are living. 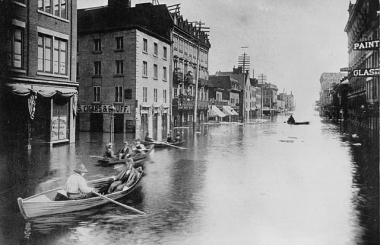 Montreal experienced flooding every spring but April 1886 is unprecedented. By 18 April, Point St. Charles and Griffintown are under 7 to 8 feet of cold water. 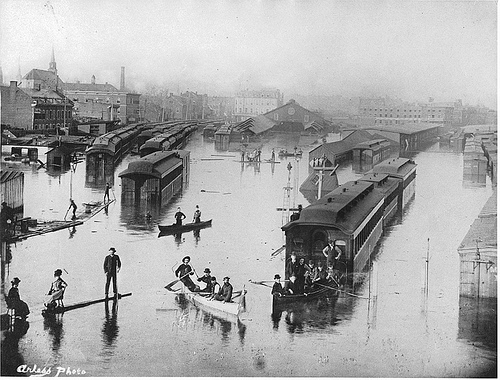 Flooding reaches Notre Dame St., Victoria Square and Bonaventure Station: rail traffic stops, communication is cut off. The ice dams rise up to the bottom of Victoria Bridge. Evacuations are taking place and there is immense property damage. 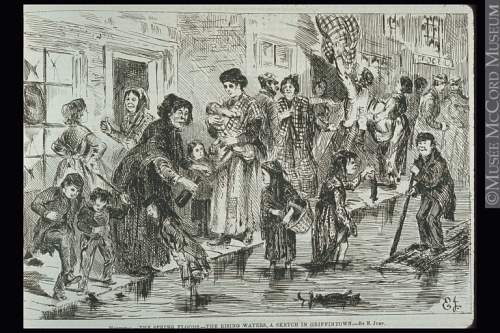 The sewers have backed up into the floodwaters, so when the waters begin to recede, disease is of grave concern. The city dispenses lime to the citizenry to help fight contagion. A daughter, Sarah Elizabeth Guilfoye, is born 3 November, 1888 and is baptized at Saint Anthony of Padua Catholic Church, Montreal. William signs Guilf – the rest is not visible. His occupation is not indicated but this church was frequented by the Irish families involved with the various railroad companies. In the Canadian Census of 1891, William Guilfy 40 is in St. Gabriel Ward, Hochelaga, Montreal with his wife, Sara 35, daughter Mary Ann 15, daughter Sara 2 and sister Marguerite 41. Margaret is not marked as married or widowed. William is a ‘journalier’ (labourer) for what appears to be written Canadien Nord. William dies 28 Feb 1900 in Montreal. He is of Saint Gabriel parish, Point St. Charles, Montreal and is buried in Notre-Dame-des-Neiges Cemetery in a common plot. In the death registry at Notre-Dame Basilica, he is Gilfoyle and a ‘charretier’ (carter). He is 53.